Unfortunately, I have yet to find that magic crystal ball to tell me the future of our lakes. However, I did compare the U.S. Drought Map of Texas for the current week to a blog on our site that featured the Texas drought map from September 2011. 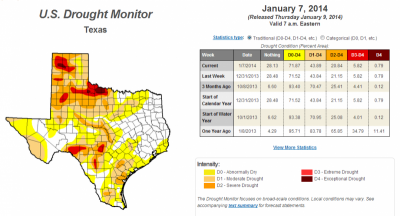 The 2011 map has Texas painted in deep red – which means exceptional drought. Today’s map is much nicer looking with whites and yellows and very little red. The areas by Lake Travis are colored to resemble moderate to severe drought (which sound much better than extreme to exceptional drought!). So, it does seem as though the drought is getting better (we’ve had some nice rains since the summer that I believe has really helped). This tells us not how the drought is affecting the market, but that the drought is better than fall of 2011. So, when I start to talk numbers next, we have a better picture in mind for comparison sake. For those statistics, I am going to focus on two MLS areas: LN and LS (think Lake Travis North, Lake Travis South). I am focusing on Lake Travis, because this is where I sell more homes, as compared to Lake Buchanan or LBJ; and because Lake Austin is not affected by drastically changing levels. Area LS includes the popular cities Lakeway and Bee Cave and area LN includes Jonestown and Lago Vista. Due to LS being closer to Austin and having more subdivisions/population than LN, you will see the sales data coming in higher for area LS. With this in mind, the following chart shows you the average sales price fluctuations from a five year period in these two areas (2013 information not included). Chart is taken from statistics provided by Austin Title. December 2013 numbers are not yet out, but from my calculations, it looks like we are going to roughly see a -1.01 change in average sales price in LS and a .84 change in LN from 2012/2013. These 2012/2013 numbers are less drastic than most of the past five year comparisons, which shows us a less volatile market over the span of these two years. Without overloading you with numbers, the 2012 average sales price in area LS was $453,375 and the average in LN was $239,183. If you are a ‘numbers-person’, email me and I can send you more data! I am still just giving you background data and have not yet made my point! When someone asks me what the lake levels are doing to property values, I have to answer their question with a question. Are they looking specifically for something that is lakefront? If the answer is yes, then OF COURSE the levels are going to affect price. No one wants to pay top dollar for a dried up dock with no guarantee that they will ever have a true lakefront again. Have we seen this drought happen twice over the last twenty years with lake levels returning: yes. Is it safe to assume lake levels will return again one day: um, yes. But no one knows when and I’m not one to bank your large investment on this assumption. When is it a good idea to invest in a lakeless-lakefront: NOW when the property values are lower due to the lack of water. Moral of the story: if you are looking for a good investment then go for it. If you will be broken-hearted if you cannot swim off your back porch this summer, you may want to look elsewhere. If they are not looking for a lakefront property, but want to be in the vicinity of a lake/like the lifestyle that the areas offer, then I have to break the question down again into the different areas: LN & LS. With area LN you are further from Austin, so people tend to want that true lake living with actual water. Therefore, the lake levels will affect property values more heavily in area LN. When the lake dries up, there are fewer things to do in this area. If you are looking for a long term investment or simply want to be far away from the city and aren’t tied too much to having high lake levels, this move is for you. I took this picture August 2013 from The Oasis — a popular entertainment complex consisting of numerous shops, boutiques and restaurants on the South shores of Lake Travis. I believe area LS is quite the opposite. While still a 30-45 minute drive to downtown Austin, people love that they are not too far from the city. The excellent Lake Travis ISD is another incentive for buyers. Communities like Ladera and Rough Hollow are popping up and selling well in this area. Lakeway is one of the most desirable areas with its variety of homes and low taxes. People like moving to this area not just because of the lake, but because of the lifestyle, schools, amenities (think golf, Hill Country Galleria) and there is growth. So, would I say lake levels are affecting this area to someone who is not specifically looking for a lakefront property: no! I believe that as area LS grows, it will only get more desirable regardless of lake levels. All in all, you have to know your buying needs and the right Realtor to match them up to the best house and area for you. I’d be happy to share more details about the numbers (I tried not to bore you too much in this blog with those!). Don’t hesitate to call or email any time to discuss.